1. 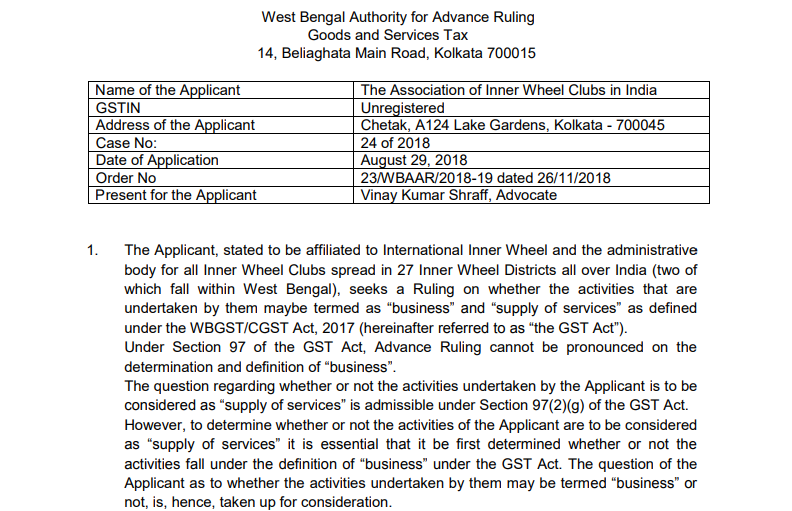 The Applicant, stated to be affiliated to International Inner Wheel and the administrative body for all Inner Wheel Clubs spread in 27 Inner Wheel Districts all over India (two of which fall within West Bengal), seeks a Ruling on whether the activities that are undertaken by them maybe termed as “business” and “supply of services” as defined under the WBGST/CGST Act, 2017 (hereinafter referred to as “the GST Act”). Under Section 97 of the GST Act, Advance Ruling cannot be pronounced on the determination and definition of “business”. not, is, hence, taken up for consideration. The Applicant states that the questions raised are neither pending before nor decided by any other authority under any proceedings under the GST Act. 2. 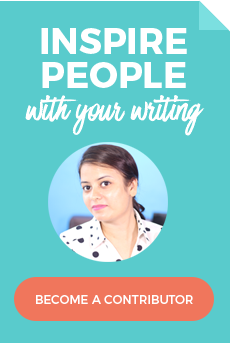 The Application states that the Applicant is affiliated to International Inner Wheel, one of the largest women’s service voluntary organisations in the world active in more than 103 countries, and the organisation is involved in social welfare work with the aim of helping people live better lives. Members of the Clubs which fall under the Applicant organize events which combine personal service, fundraising, fellowship and fun, united by friendship and to serve the local community. They provide financial and other practical support to the financially disadvantaged classes, including people suffering from natural disaster or in war-torn regions. The club accumulates funds through subscriptions, sponsorship fees, the sale of souvenirs etc. The Application also states that if the Association dissolves the liabilities and assets will be distributed to other organisations having like objectives. The Clubs which fall under the Applicant do not provide any facility or benefit to any of its members. The subscriptions/membership fees collected from the members are utilised entirely for funding charitable work. Commissioner of Sales Tax v. Sai Publication Fund [(2002) 126 STC 288 (SC)]. Supreme Court observes that if the main activity is not business, then activities ancillary to the main activity are not to be treated as a business. The Applicant also submits that the activities of the clubs do not fall within the ambit of “supply” as explained under Section 7(1) of the GST Act. 4. The Application, as well as the literature subsequently submitted by the Applicant regarding the Constitution, workings and objectives of the International Inner Wheel and the Bye-Laws of the Association of Inner Wheel Clubs in India, the Applicant, does not provide for any “import of services”, nor for any of the supplies of goods or services, with or without consideration, as enumerated in Schedules I and II. The activity of the Applicant, therefore, is to be considered in the light of Section 7(1)(a) of the GST Act. 5. Upon careful perusal of the documents as mentioned above, it is seen that there are well laid down objectives of the Applicant, as well as that of the International body with which the Applicant is affiliated. To be a Member of an Inner Wheel Club definite qualifications are specified. Membership fees are also charged, renewable annually. Active Membership may be terminated on failure to pay an annual subscription by 31st December. An Honoured Active Membership subscription will be paid by the particular Club of which she is a member, only for the year, she is awarded the Honoured Active Membership. Thereafter, the Honoured Active Member is required to pay all her dues. Honorary Members are invited annually and may be subject to re-election, Membership at Large is also payable on payment of the appropriate International Inner Wheel Capitation Fees. It is also seen that each Club of Inner Wheel is required to pay the International Inner Wheel such Annual Capitation Fee for each member as shall be determined from time to time at the annual Convention, or, if in the years between, the inflation of the pound sterling makes a Capitation Fee increase necessary, the Governing Body is authorised to increase the Capitation Fee with the same percentage as the increase in the cost of living index in the UK, but not exceeding 5%. 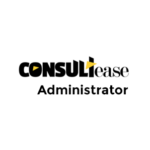 The Applicant, as a National Governing body of, and, being affiliated to the International body, is bound by these laws. And the Applicant’s bye-laws also mention the annual subscription fees payable by each member. Voting rights are withdrawn from Clubs in arrears with dues. Similar requirements regarding Membership fees and/or subscriptions and voting powers are in the District Committee Rules as well as in the Club Rules. As per the information available in the public domain, members of Inner Wheel Clubs can access various programmes including those in the UN, a privilege not available to non-members. 6. It is thus, clear, from the above reads that the Inner Wheel Clubs have specific objectives and members are granted various facilities and/or benefits, enabling them to attend conventions/meetings for the furtherance of the objectives of the Organisation, against subscriptions or fees, renewable annually. In other words, the annual membership subscription facilitates the member to further the objectives of the Organisation and be associated with other similar organisations, both nationally and globally, arranged for by the Organisation. Such facilities/benefits are not available to the non-members of the Organisation. 7. There is also a provision by the Inner Wheel Clubs to award their members for their outstanding services. The Margarette Golding Award is one such award, which appears to be the equivalent of ten pounds sterling (plus the bank draft fee) payable by the presenting Club or District or the National Governing Body to the National Treasure. The Applicant’s Income and Expenditure and Receipts and Payments Accounts for FY 18 and the Balance Sheet as on March 31, 2018, provide an idea of the nature of financial transactions made by the Inner Wheel Clubs. It appears that the fund collected is mainly spent on organising meetings and conventions like Triennial etc. Clearly, such meetings and gatherings provide facilities and benefits to the members in the form of a platform for social mixing, networking, promotion of friendship etc. 8. 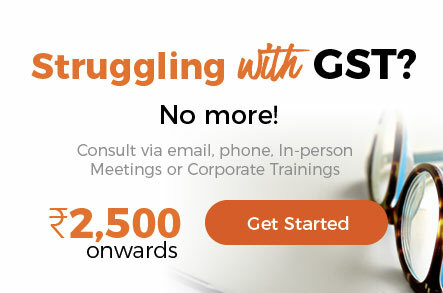 The term “business” under the GST Act includes, under Section 2(17), subclause (e) “provision by a club, association, society, or any other body (for a subscription or any other consideration) of the facilities or benefits to its members. It is, thus, clear that the Applicant is doing “business” as defined under section 2(17)(e) of the GST Act. The subscription and membership fee is to be considered as consideration for the supply of such services, which are classifiable under SAC Heading 99959 under the category ‘Services furnished by other membership organization’. 9. The Application also states that the Inner Wheel Clubs falling under the Applicant take part in a wide range of work for charities and causes across the world with the aim of helping people live better lives. Such activity by an entity is an “adventure” and maybe be treated as a business under Section 2(17)(a) of the GST Act, and a taxable supply of service if consideration is charged from the recipient. 10. However, the Applicant also has activities which involve providing space for advertisements, raising sponsorship etc, and the transactions regarding these activities are, therefore, business transactions within the meaning of section 2(17)(b), being transactions undertaken in connection with or incidental or ancillary to the social welfare activities of the Applicant, and are supplies in terms of Section 7(1) of the GST Act. Such services are classifiable under SAC Heading 99836 under the category ‘Advertising services’. Sale of souvenirs is to be treated as a supply of goods. 11. The decision of the apex court in Sai Publication Fund (supra) is clearly not applicable in the present context, as the main activity is to be treated as a business. The Applicant’s activities involve supply of services classifiable under SAC Heading 99959 against consideration received in the form of subscription and membership fees. Services classifiable under SAC Heading 99836 are also supplied. Sale of souvenirs is to be considered as a supply of goods. The nature of supply for miscellaneous income as recorded in the Financial Accounts is to be determined by the nature of the supply. This Advance Ruling is valid subject to the provisions under Section 103(2) until and unless declared void under Section 104(1) of the GST Act.